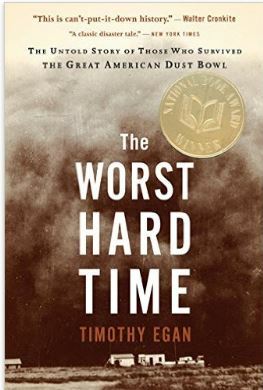 When I started reading The Worst Hard Time by Timothy Egan, I did a quick search on “Dust Bowl” for a little background information on the subject of the book. The Wikipedia article says little about what Egan identifies as the major factor: Government land giveaways and wheat price guarantees which resulted in tremendous overproduction, price collapses, bankruptcy of farmers, and abandonment of plowed land. Plowing for the purpose of growing wheat had destroyed the soil-stabilizing native grasses, leaving the dirt at the mercy of persistent high winds. According to the Wikipedia article, the cause was poor farming practices such as failure to rotate crops or use cover crops. The evidence is that following government advice is a poor farming practice also, so the article is not completely wrong. Egan’s book bears heart-breaking descriptions of the resulting damage and its impact on both cowboys and farmers who lived in that section of the country once known as the Great American Desert. The problem was intensified by so-called “suitcase farmers” who flew in, bought large pieces of land with the help of the recently-passed Federal Farm Loan Act, plowed the sod under to plant the over-priced wheat, and then flew out when the prices collapsed. At the time, the official position of the federal government was expressed by the Federal Bureau of Soils: “The soil is the one indestructible, immutable asset that the nation possesses.” By 1934, the federal government had switched strategies and was offering to pay farmers to not grow wheat, to “bank” the soil, so to speak. There was one Harvard geologist who attributed the problems to climate change, and many apparently believed that because considerable effort was expended trying to cause rain. Conditions did not improve, however, and responding to urgent pleas for help, President Roosevelt flew into the region in July, 1938. With his arrival, coincidentally I suppose, came an end to a drought that had lasted several years. But, neither the president nor the rain solved the underlying problems. It’s a great story, but don’t read the book to learn about government missteps. Read it for the stories of the hardy, courageous, and resilient settlers who made their homes on the prairies, suffered, and survived, some of whom were still living decades later and were interviewed for the book. Here is a 1919 NY Times story about the wheat price guarantee. Note: The quotes above are from the book, which I read on Kindle without benefit of page numbers. Did you know that with a Kindle it is now possible to borrow books from Amazon at no cost? That is what I did with this one.